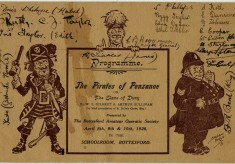 This set contains pages of the programmes of Bottesford Amateur Operatic Society productions of Iolanthe, in 1925, and Pirates of Penzance, in 1926. 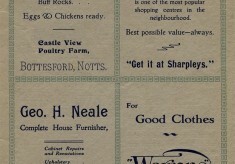 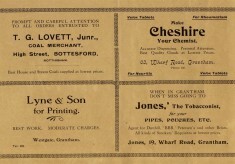 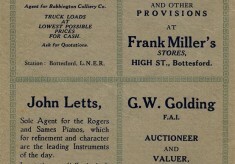 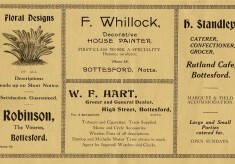 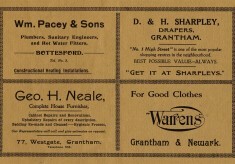 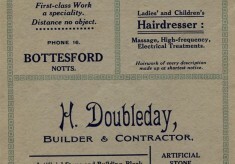 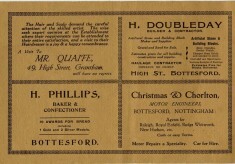 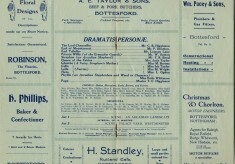 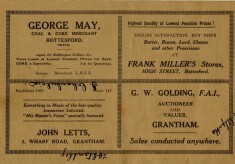 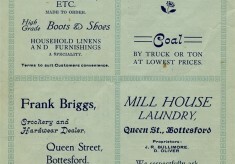 In addition to information about the cast of local people, they include advertisements of local businesses of the 1920s. 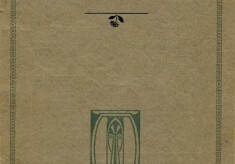 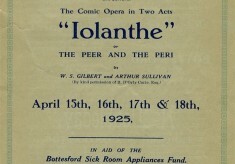 The outer cover page of the programme of Iolanthe. 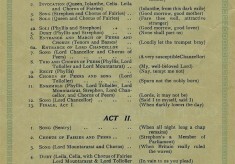 This is the inner title page of the programme of 1925 for Iolanthe by W.S. 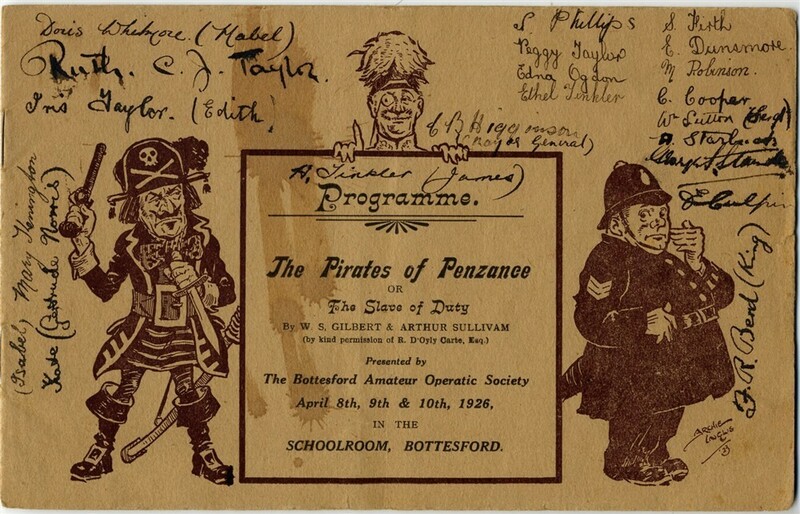 Gilbert and A. Sullivan. 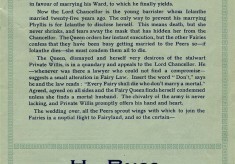 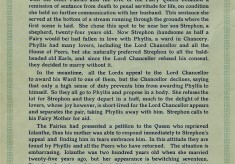 This page displays a synopsis of the plot of this famous comic opera from the Gilbert and Sullivan series. 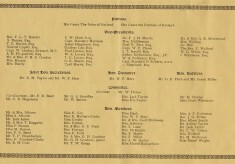 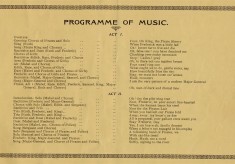 The programme of the two-act opera. 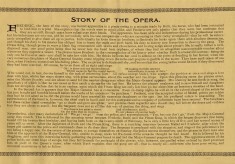 This page gives a good synopsis of the plot of the opera. 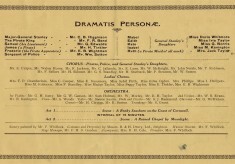 Dramatis Personae, including the principle roles, chorus, orchestra and back-stage team. 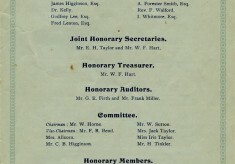 This page lists the members of the Society, starting with the patrons Their Graces the Duke and Duchess of Rutland. 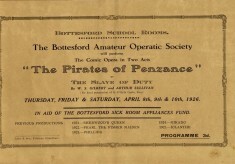 The programme of the opera in two acts. 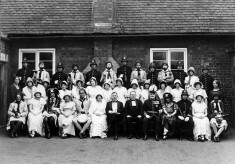 The cast of the Bottesford Amateur Operatic Society’s production of Pirates of Penzance, 1926. 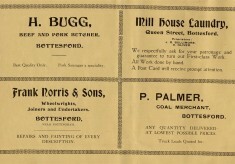 This picture appeared in the programme.